When you're reading this post we have less than 10 days toward the end of the month. And yes, I feel so guilty right now for abandoning my blog for such a long and horrible time. But I'm going to make this post worth it. 2. Happy Valentine Day for those whom in love and those whom passed the day with best friends like I did! 3. Happy 1st Birthday to Belle Spell! Right, exactly on February 2nd, Belle Spell has been around for one year. Yipee! Honestly I was thinking about what should I do to my lovely readers, until some weeks ago I got an amazing idea. You know I got a burning passion to be a fashion designer. Lately, step by step, I've been trying to realize my designs into a collection. Yes, you heard right! I'm on my way to release my own clothing line named "CINCIN". It will only be a small scale of clothing line with limited stock. I'm going to have a giveaway to commemorate Belle Spell 1st anniversary. And the prize will be a leather top (as in my photos in this post), a piece from my collection. It's a RTW design that I cherish a lot and you'll be the one that lay hands on it first before I launch it! I'll choose the winner completely random. The giveaway starts from now until April 10th and yes it opens internationally! Good luck! Love those shoes! And congrats to your blog. love the bright red pants..youre a very pretty girl sweetie :)! Such a lovely leather top! Can't wait to see your full collection!! Wow congratulations!! 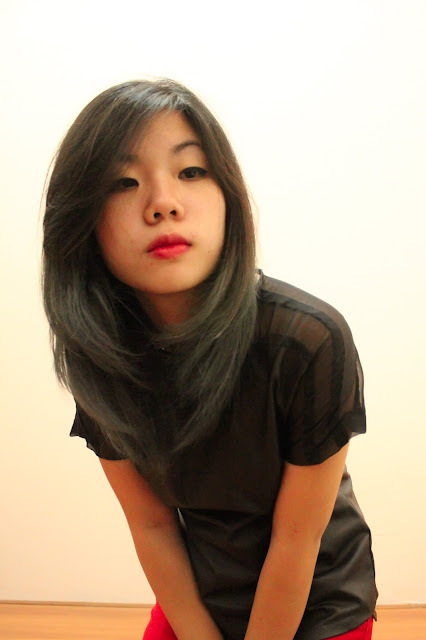 Hoping for the best for the blog :) Anyway you're looking simply awesome in that outfit!! Absolutely loving your sheer top! Exorcisms, Soul Healing, Spirit Guidance, Paranormal Activity, Spiritual Counseling, Spiritual Enlightenment, Casting out Evil Entities, Energy Healing, Protection from Satan and Satanic Rituals, Demonic or Satanic Possession, Removing & Reversing Magic, Occult Magic, Voodoo Witchcraft, Sorcery and All other types of Magic you can think off.